People expect a lot more from the Popes; at times, some of them are unrealistic. Like the way, followers look forward to the papacy to be savvy political operators, able to wave a magic wand and make all the world's problem disappear. This is a completely unrealistic vision, but that never stopped the Popes from trying, and Pope Francis perhaps the more than most. In a recent peace gesture, Pope Francis knelt at the feet of the leaders of South Sudan, begging them to give peace a chance and be worthy, "fathers of the nation." The dramatic short video of their meet and greet is now going viral on social media with people applauding the Pope. Pope Francis, Grand Imam of Egypt Kiss In UAE, Call For World Peace; See Pic. 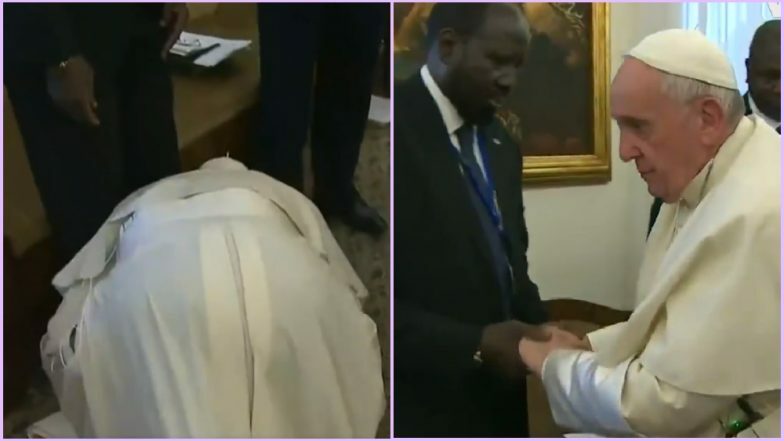 The gesture occurred during a spiritual retreat at the Vatican on April 11 where the President of South Sudan, Salva Kiir and four of the nation's five designated Vice Presidents; Riek Machar, James Wani Igga, Taban Deng Gai and Rebecca Nyandeng De Mabior. Reportedly, under the terms of a peace agreement which was signed in September, 2018, the vice presidents were to take office together on May 12, while sharing power and ending all the armed conflict between cans and among communities. Pope Francis Allows Worshipers Kiss His Papal Ring After Viral Video Controversy. Pope Francis said to President Kiir and the opposition leader, Reik Machar, "I'm asking you with my heart," clutching his hands in front of his chest, "Stay in peace." Francis was further quoted as saying, "There will be fights among you, but let these be inside the office," staring the leaders and other South Sudanese officials in the eye and urging them to respect their recent armistice and commit to forming a unity government. "But in front of the people, hold hands," he added. This way, Francis said, they can "become fathers of the nation." South Sudan gained its independence from Sudan in 2011 after years of war. Many people have lost their lives or been forced from their homes or face starvation because of five years of civil war. After "so much death, hunger, hurt and tears," the pope only urges for peace to the retreat participants.